Volkswagen was pretty blunt when it unveiled the Touareg in 2003. This was the people’s cars’ answer to the Porsche Cayenne, the BMW X5, the Range Rover, and the Volvo XC90, and they planned on proving a thing or two. If you felt like doing the same, you may still own a Volkswagen Touareg. Let’s look back at what you bought, what Volkswagen learned from their rivals, and why you may want to call ‘time’ on your Touareg. Like many rivals, the Volkswagen Touareg and Porsche Cayenne started out as allies. Both vehicles were largely co-developed. If you chose the Touareg you still received the same AWD system, transmission, chassis, windshield, and doors as the Cayenne. After two years of secret, competitive developments, the Touareg was hailed as the superior off-road vehicle, while the Cayenne was seen as the preferred choice for on-road action. Upon release, you could choose from four engines. If you preferred petrol there was the 3.2-litre V6 or the 4.2-litre V8, while diesel engines gave you the option of either 2.5-litres or a huge 5.0-litre V10 engine that delivered a top speed of 140mph, 0-50mph in 7.5 seconds, and a torque of 329lb ft. at 2000rpm. Not bad if you wanted to take the kids out in comfort, but still scare the heck of them. Volkswagen had already revised their V10 diesel, and introduced a 3.0-litre V6 TDI engine, when the spectre of the Audi Q7 appeared on the horizon. Both manufacturers had their eyes on the North American market, and both knew a stalemate could damage mutual sales. 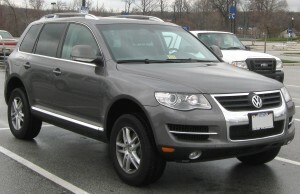 Volkswagen relented in summer 2006, replacing the 4.2-litre V8 Touareg with a 3.6-litre VSI engine. Not that they held back for long, releasing the R50 V10 in autumn 2007. This delivered a top speed on 147mph, 0-62mph in 6.4 seconds, and 627 lb.ft of torque at 2000 rpm. All of this was delivered via a 4XMOTION four-wheel drive, six-speed automatic gearbox. Expensive cars are expensive to fix, and the Touareg proves this. Failing valve chests in automatic gearboxes are common, causing gears to suddenly slip from 5th to 4th. This is a staggering £1,900 to repair. Regular centre bearing failures on rear prop shafts are frequent, costing £1,000 to replace. Sticking swirl flaps in inlet manifolds are another expensive problem. Sadly, Volkswagen won’t officially acknowledge these issues, but many owners do. If you experience this, call time on your Touareg, scrap it, and move onto something new. To scrap your VW Touareg, contact Scrap Car Kings today, or visit us online for a free quote.